The statement posted on the FB page of the group of Second Home circulating around following events at Autonomous Factory Rog asks for a response. The following text is a statement from Rog´s users who were part of these events, who are more aware of the details and know the circumstances at Rog better. Slabo leto pred lokalnimi volitvami je svoj propagandni video za Center Rog, spremenjeni oz. prenovljeni projekt nekdanjega CSU Rog, ki naj bi v obstoječi načrt prenove vključil "več javnih vsebin" pripravila tudi Mestna občina Ljubljana. Seveda ob tem v svoji izčiščeni arhitekturno-urbanistični viziji konkretnih vsebinskih načrtov (razen javne knjižnice, razstavne hale, 3D RogLab in nekaj ducat ateljejev) ne omenjajo! So pa zato dokaj bolj jasno vidne bodoče pridobitve obveznih komercialnih vsebin v obliki umetniških trgovin, kavarn in restavracij ob Ljubljanici ter podzemne garaže na dvorišču. One year after the occupation - in 2007 - the municipality began planning the renovation of the area into a “Creative centre Rog”, putting the emphasis on redeveloping the surroundings in order to build an attractive area for international artists and tourists. With the help of an EU-led project devoted to revitalization of ex-industrial zones, they propose a public-private partnership to renovate the main factory building, the construction of a design hotel, up-standard apartments and commercial programs. The public-private ration is 20-80%. One of the proposals also suggests a relocation of 3 art academies to Rog, but their deans deny it, because of non-defined relations between academic and commercial programs and because they don’t want their students - who are active in the factory - to lose their studios/ateliers. The municipality could never find an investor because of global recession, so they down-scaled the project into an all- publicly financed “centre for architecture, design and visual arts” stressed on developing the creative industries economic sector and helping young designers into entering the labor market. 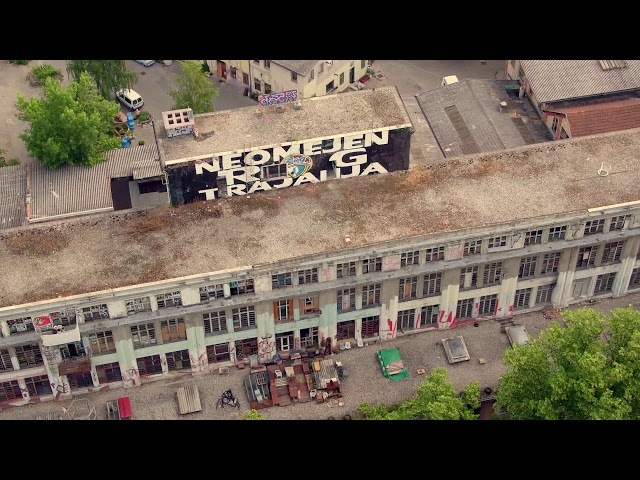 Chronology of the factory spaces on Trubarjeva street. 1871 - The land is bought by Ivan Janesh who builds a smaller groundfloor building for tanning hides. 1879 - Janesh upgrades it into a one storey building that holds a tanning workshop. 1884 - His sons build the second floor. 1900 - The tannery is bought by Karel Pollak, who renovates and modernizes the workshop. 1904 - Pollak surrounds the area with a wall and builds a residential villa. SOLIDARNO ZA NEOMEJEN ROG TRAJANJA! Rog: from bike factory to ‘experimental asylum’.